On Dec. 26, the Hayabusa2 was revealed at the Sagamihara Campus. As its design was completed this spring, the Hayabusa2 will soon undergo the first integration test to confirm the interfaces among onboard devices as well as between the devices and the explorer’s bus after assembling them onto the bus. Also, the flight models of the Hayabusa2’s main body and solar array paddles have already been manufactured, thus those models will be verified through a vibration test. In addition, the exposed environment for the onboard devices will also be measured. 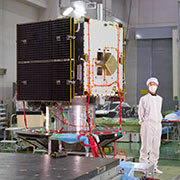 JAXA is developing the Hayabusa2 to be ready for its launch in 2014. Astronaut Hoshide safely returned to Earth on Nov. 19 after staying at the International Space Station (ISS) for about four months. Hoshide held a press conference on the 29th for the first time after his return. With a beaming smile, he talked about his missions during his expedition and progress with his rehabilitation after his return from space. He will continue his rehabilitation and undergo medical checkups while preparing for a report meeting on the technical and engineering issues regarding his long stay at the ISS. At 10:56 a.m. on Nov. 19 (Mon., Japan Standard Time), Astronaut Hoshide came back to the Earth safely on the Soyuz spacecraft (31S), which successfully landed in the Republic of Kazakhstan. Astronaut Hoshide started his expedition mission at the International Space Station from July 17, 2012, and conducted various missions including experiments with the aquatic habitat and small satellite deployment. He also engaged in three extravehicular activities, and, as a result, he logged the longest total hours of spacewalks for a Japanese national. Thank you very much for your support. Astronaut Hoshide is coming home! Astronaut Akihiko Hoshide will return to the Earth after completing his expedition mission on the International Space Station (ISS) for about four months. The Soyuz spacecraft, which Astronaut Hoshide will be aboard, is scheduled to depart from the ISS at 7:26 a.m. on Nov. 19 (Japan Standard Time) and arrive on Earth at 10:53 a.m. on the same day (JST). We will broadcast his return trip live on the Internet. You can also watch the live report at some public viewing spots including JAXA offices. Please welcome home Astronaut Hoshide with us! Astronaut Hoshide completed his third extravehicular activity! The extravehicular activity this time was for the purpose of isolating the radiator, which was highly suspected as the cause of an ammonia leak, from the photovoltaic thermal control system (PVTCS), and for rerouting the ammonia flow through a spare radiator. The spare one works properly, and, after visually inspecting the Solar Array Rotary Joint (SARJ) and performing other tasks, the two spacewalkers successfully completed their extravehicular activities, which lasted six hours and 38 minutes. The return date for Astronaut Hoshide, who is now staying at the International Space Station (ISS) for an expedition mission, was delayed by one week due to a launch schedule change of the Soyuz Spacecraft (32S). He is scheduled to come home at 11:00 a.m. on Nov. 19, 2012 (Japan Standard Time.) Because of the delay, Astronaut Hoshide will perform another extravehicular activity on Nov. 1. Please keep monitoring his life in space. Astronaut Kimiya Yui has been selected as a crewmember for the 44th/45th Expedition Mission to the International Space Station (ISS). Astronaut Yui was chosen as an astronaut candidate in February 2009 and certified as an ISS astronaut in July 2011. Since then, he has continued to maintain and improve his qualities as an ISS astronaut. For Astronaut Yui, this long duration stay aboard the ISS will be his first space flight. As a flight engineer, he is scheduled to engage in operation of the ISS and science experiment using the space environment. Live broadcast of small satellite deployment! A small satellite will be deployed from the Japanese Experiment Module “Kibo” from Oct. 4 to 5 through a collaboration between Astronaut Hoshide, who is on the expedition mission at the International Space Station, and ground personnel at the Mission Control Room. We will broadcast the event live through the Internet in the following two parts. Please enjoy our live report! Astronaut Hoshide, who is currently staying at the International Space Station for a prolonged period, has been smoothly carrying out his missions and activities such as a “sample collection session of the microbial dynamics at the ISS” and training for the arrival of the "Dragon" spaceship. We are currently coordinating the date and time for a small satellite deployment whose original schedule was postponed due to the revision of the ISS operation timetable. On Oct. 12, JAXA will hold the "JAXA Aviation Symposium in NAGOYA - Let' talk about environment-friendly aviation technology with the world's top organizations." We invite personnel from major aviation research institutes from around the world as well as foreign and domestic aviation related businesses and organizations to hold lectures and discussions for achieving environment-friendly next generation aviation technology. Participation is free. Please come and join us. * English-Japanese simultaneous interpretation service is available. KOUNOTORI3 completed its mission with re-entry! The KOUNOTORI 3 successfully achieved its mission of taking cargo to the ISS, then completed all its tasks over about 56 days. We would like to send our sincere appreciation to all of you who have been supporting the KOUNOTORI project. KOUNOTORI3 departure and re-entry live report! The H-II Transfer Vehicle “KOUNOTORI3” (HTV3,a cargo transporter to the International Space Station) will leave from the ISS at around 0:50 a.m. on Sept. 13 (Japan Standard Time, all the following dates and time are JST,) and will re-enter the atmosphere at around 2:24 p.m. on Sept. 14. JAXA will offer a live report of its departure from the ISS from 0:20 a.m. on the 13th (Thu. ), then a live scene of the HTV operation room at the time of its re-entry from 1:45 p.m. on the 14th (Fri.) through the Internet. Please do not miss the footage! Astronaut Hoshide went out for his second spacewalk from 8:06 p.m. on Sept. 5 (Japan Standard Time) to finish the work following the first one on Aug. 30. With Astronaut Suni Williams, he completed the installation of a Main Bus Switching Unit (MBS), which was suspended during the first extravehicular activity. They also replaced a camera and light on the International Space Station's robotic arm and completed their spacewalk at 2:34 a.m. on Sept. 6 (JST). JAXA completed the initial functional verification of the Global Change Observation Mission 1st - Water "SHIZUKU" (GCOM-W1) and has moved to the regular observation operation on August 10 as scheduled. The SHIZUKU was launched by JAXA from the Tanegashima Space Center on May 18, 2012. We will first perform the initial calibration and checkout during which acquired data will be compared with observation data on the ground for confirming data accuracy and make some data correction. The KOUNOTORI3 (HTV3, a cargo transporter to the International Space Station) was captured by the ISS robotic arm at 9:23 p.m. on July 27 (Japan Standard Time) and berthed at the ISS at 2:31 a.m. on July 28. The KOUNOTORI3 was launched by the H-IIB Launch Vehicle No.3 on July 21. ISS astronauts will take cargo out from the Pressurized and Unpressurized Logistic Carriers into the ISS. Live broadcast of KOUNOTORI3 trip to ISS! The KOUNOTORI3 (HTV3, the cargo transporter to the International Space Station) launched on July 21 has been traveling to the ISS while adjusting its altitude. Between the evening on July 27 and early on the morning of July 28, the KOUNOTORI3 will make a final approach and berth at the ISS. JAXA will provide a live broadcast of its final access, capture, and berthing. Please don't miss the broadcast! The H-IIB Launch Vehicle No. 3 with the KOUNOTORI3 (HTV3, a cargo transporter to the International Space Station) onboard lifted off from the Tanegashima Space Center at 11:06:18 on July 21 (Sat., Japan Standard Time.) The launch vehicle flew smoothly, and at 14 minutes and 53 seconds after liftoff, the KOUNOTORI3 separation was confirmed. The KOUNOTORI3 will gradually go closer to the International Space Station, and it will be berthed at the ISS. We will broadcast the berthing on our website, so don't miss it! JAXA will broadcast a live launch report from the Tanegashima Space Center from 10:00 a.m. on the 21st. You can watch it through the Internet, at JAXA facilities, and some public viewing spots including science museums. At the launch special site on our website, you can find articles by project managers who are preparing for the launch, and you can also send support messages to us. Please have a look! The Soyuz spacecraft, which Astronaut Akihiko Hoshide was aboard, was launched at 11:40 a.m. on July 15 (Sun., Japan Standard time) and docked with the International Space Station at 1:51 p.m. on July 17 (Thur., JST.) The hatch to the ISS was opened, and Astronaut Hoshide's first long-term stay there has started. He is the fourth Japanese astronaut to stay at the ISS for a prolonged period. He will live there for about four months as a flight engineer for the 32nd /33rd expedition crew and perform science experiments and robotic operations. Please keep following our updates and don't miss his activities in space. We are welcoming support messages from you! The Soyuz spacecraft with Astronaut Akihiko Hoshide aboard was launched from the Baikonur Cosmodrome (Republic of Kazakhstan) at 11:40 a.m. on July 15 (Sun., Japan Standard time.) The Soyuz will dock with the International Space Station on July 17 (Thu.) JAXA will broadcast a live report of the Soyuz crew including Astronaut Hoshide entering the ISS on July 17. Please watch it! SHIZUKU onboard sensor (AMSR2) acquired observation data! SHIZUKU onboard sensor (AMSR2) acquired observation data! JAXA acquired observation data on the Earth from the Global Change Observation Mission 1st - Water "SHIZUKU" (GCOM-W1). The SHIZUKU was launched on May 18, 2012 (Japan Standard Time) from the Tanegashima Space Center and started regular observations by the onboard sensor, Advanced Microwave Scanning Radiometer 2 (AMSR2,) on July 3 after entering into the A-train orbit on June 29. The data was acquired by the AMSR2. We will continue the initial functional verification, then confirm data accuracy and perform initial calibration and inspection operations including data correction. SHIZUKU inserted into A-Train orbit! JAXA confirmed that the Global Change Observation Mission 1st - Water “SHIZUKU” was inserted into a planned position on the A-Train orbit. The SHIZUKU was launched by the H-IIA Launch Vehicle No. 21 from the Tanegashima Space Center on May 18. The A-train, or the Afternoon Constellation, is a cooperative Earth observation system that consists of multiple satellites from some countries. Japan has participated in the system for the first time with the SHIZUKU. JAXA will verify observation performance of the Advanced Microwave Scanning Radiometer 2 (AMSR2) aboard the SHIZUKU. On June 6 (Wed.), HINODE captured images of Venus passing in front of the Sun, which was an astronomical spectacle observed from all over Japan. The acquired images show that the rim of Venus was brightened like a ring due to sunlight that underwent a refraction bend through Venus' atmosphere, when Venus was about to come in front of the Sun from its north-eastern side. An astronaut staying at the International Space Station also took images of the transit of Venus across the sun. Annular solar eclipse observed by HINODE and MICHIBIKI from space! The Solar Physics Satellite “HINODE” and the Quasi-Zenith Satellite-1 “MICHIBIKI” shot some images of an annular solar eclipse from space. The big astronomical event took place on the morning of May 21 (Mon. ), and could be observed from many places in Japan including metropolitan areas. The HINODE captured a scene when the moon traveled across in front of the sun thus the black moon passed through in front of the solar corona. The MICHIBIKI captured images of the Earth where the area above Japan was blackened due to the moon’s shadow. The Global Change Observation Mission 1st - Water "SHIZUKU", which was launched from the Tanegashima Space Center on May 18, completed its critical operations as it was successfully inserted into the initial orbit and finished the AMSR2 run-up and other essential events normally. JAXA will take about 45 days to insert the satellite into the "A-Train orbit" in order to participate in an Earth observation mission called the "A-Train" in cooperation with satellites of other countries while performing the initial functional confirmation for about three months. Successful launch of H-IIA F 21 with SHIZUKU and SDS-4 aboard! The launch of the H-IIA Launch Vehicle No. 21 with The Global Change Observation Satellite 1st - Water "SHIZUKU" and Small Demonstration Satellite-4 (SDS-4) aboard was successfully performed at 1:39 a.m. on May 18 (Fri.) 2012 (Japan Standard Time). The launch vehicle flew normally and separated the SHIZUKU at about 22 minutes and 59 seconds after liftoff. Then, the Small Demonstration Stellite-4 (SDS-4) was also confirmed to be successfully separated as scheduled. The SHIZUKU will conduct critical phase operations including deploying the AMSR2 antenna. We await your support messages! SHIZUKU Launch Live broadcast to start at 1:10 a.m. on May 18! The Global Change Observation Mission 1st-Water “SHIZUKU” will be launched this weekend, at 1:39 a.m. on May 18 (Fri.) from the Tanegashima Space Center. JAXA will broadcast the live launch report from around 1:10 a.m. on May 18. You can watch it through some cable TV stations or websites, and via cell phones and smart phones. Please watch the SHIZUKU launch with us in real time! SHIZUKU to be launched next weekend! The Global Change Observation Mission 1st-Water “SHIZUKU” was encapsulated by the payload fairing on May 4 (Fri) at the Tanegashima Space Center. The satellite is now in the very final preparation phase for launch scheduled next weekend. At the SHIZUKU special site (at the Japanese site only), we publish photos of hand-made craft of the SHIZUKU made by many of you. We continue to accept support messages as well as your hand-made SHIZUKU craft. Please join us! Let's feel the magic of space during Golden Week! Following Science and Technology Week, JAXA will hold more events during Golden Week. On April 28, you can try on a space suit or enjoy a hand-made event by JAXA employees at the Katsuura and Okinawa Tracking and Communication Stations. On May 5, many fun events are prepared for the “Planet Fuchinobe Festa”, including a dance performance expressing the theme of the Hayabusa, and a lecture by Dr. Junichiro Kawaguchi. Also, at the JAXA Town Meeting, we would like to discuss the significance of aerospace research and development with participants. Please join our events during Golden Week! Launch date of Soyuz Spacecraft with Astronaut Hoshide aboard decided! A target launch date of a Soyuz spacecraft (31S/TMA-05M), which Astronaut Hoshide will be aboard, was set for July 15, 2012 (Japan Standard Time). It will be launched from the Baikonur Cosmodrome (in the Republic of Kazakhstan). Astronaut Hoshide will stay at the International space Station (ISS) as an Expedition 32/33 crewmember for about four months to perform scientific experiments using the space environment, ISS system operation, and robotics operation. JAXA will send Astronaut Kimiya Yui to the 16th NASA Extreme Environment Mission Operations (NEEMO 16) as part of his training to stay at the International Space Station (ISS) for a prolonged period. JAXA is going to hold its annual open-house event at our facilities in Japan for Science and Technology Week in April. The open-house at the Tsukuba Space Center on April 21 (Sat.) will be the opener for the series of events held at other facilities on later dates. We will prepare fun events and some programs that visitors can participate in such as lectures, plastic-bottle rocket making, and treasure hunting using the MICHIBIKI satellite and GPS. Please come and join us. You will feel the "sky" and "space" much closer! HAYABUSA's returned capsule completes its exhibition trip in Japan! After holding the first special exhibition of the HAYABUSA’s capsule, which returned from space, at the Sagamihara Campus in July 2010, the same event was held all over Japan. Through the exhibitions, we wanted to share not only the successful mission and display of the capsule, but also the attitude of “never give up” that the HAYABUSA taught us. On April 3, 2012, all the itinerary of the capsule’s trip was completed. At the last venue in Kariya, Aichi Prefecture, we especially welcomed the 882,300th visitor to our exhibition series, as the pronunciation of 8,8,2,and 3 in Japanese is similar to “Ha(8) Ya(8) Bu(2) Sa(3).”We received a total of some 890,000 people at 69 venues who, we hope, enjoyed the HAYABUSA’s miraculous long journey. To all visitors, thank you very much for coming. Also, we would like to extend our sincere appreciation to all the parties and people who cooperated with this HAYABUSA exhibition trip in Japan. The Dual-frequency Precipitation Radar (DPR), which will be installed on the main satellite of the Global Precipitation Measurement (GPM) mission, was delivered to NASA on March 30. The DPR is an advanced precipitation measurement radar with the world’s best accuracy, and the GPM mission will enable global measurement of precipitation every three hours with other constellation of satellites from international partners based on the DPR observation data as a norm. Following the installation of the DPR on the GPM main satellite, NASA will perform the system integration test there, then the satellite will be shipped to Japan for launch by the H-IIA Launch Vehicle from the Tanegashima Space Center in JFY 2013. The launch date and time were decided for the Global Change Observation mission 1st - Water "SHIZUKU" (GCOM-W1) and for the H-II Transfer Vehicle "KOUNOTORI3" (HTV3), a cargo transporter to the International Space Station. Both will be launched from the Tanegashima Space Center. JAXA/ISAS international top young fellow Dmitry Khangulyan and other researchers have been analyzing the super high energy gamma-ray radiation that is periodically changing and observed around the “Crab Pulsar,” and found that it was the radiation derives from the pulsar wind (electron and positron flows) that has been considered to be impossible to detect. This discovery is the first direct demonstration of the existence of the Pulsar Wind. It was also revealed that the Pulsar Wind reaches an extremely high speed near the Pulsar that is 99.999999999% of light speed. Those findings are significant analysis results that are difficult to explain under conventional theoretical models, thus the related thesis was published in the British science magazine “Nature”issued on Feb. 23, 2012. Japan Aerospace Exploration Agency (JAXA) has been engaged in initial analysis of Itokawa’s sample brought back by HAYABUSA. On this occasion we would like to inform you of offering the announcement of opportunity for HAYABUSA Sample Investigation. Through the peer review, JAXA will provide HAYABUSA sample to researcher who submits research proposal in the framework of this Announce of 0pportunity (herein after referred as "AO"). This AO is planned to be conducted a few times. The 1st International AO issues on January 24th 2012. Astronaut Furukawa will talk about his stay and activities as well as how he felt on the ISS using photos and images. He will then explain about experiments at the ISS Japanese Experiment Module “Kibo.” Please come and join us with your friends! Participants are recommended to be high school students or older.